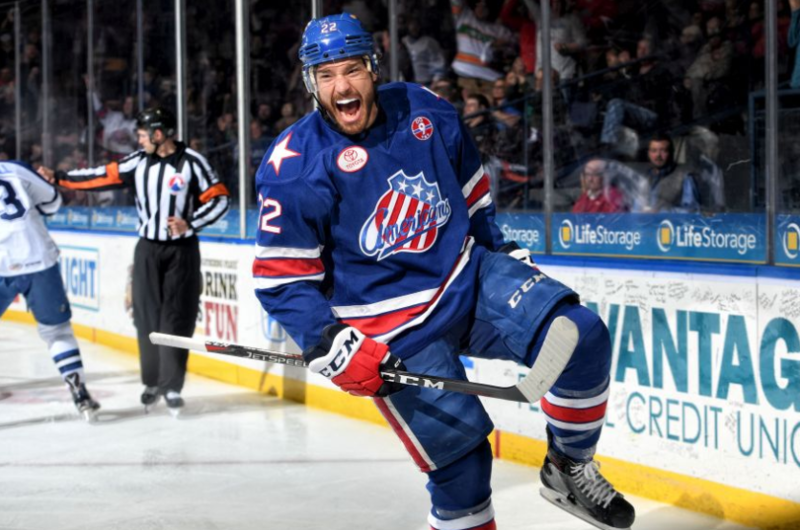 Zach Redmond Sets a New Amerks Franchise Record · Let's Go Amerks! Rochester Americans defenseman Zach Redmond has broken the franchise record for goals by a defenseman in the regular season with his 19th goal of the season. It’s a record that stood for 46 years set by Rick Pagnutti during the 1972/1973 season scoring 18 goals. Redmond scored twice against the Wilkes-Barre/Scranton Penguins on January 18, 2019 to tie the record and then scored his 19th against the Binghamton Devils on Wednesday night to break it. His 19th goal was also the game winning goal in the Amerks 7-5 win over the Devils. Redmond started the season with 13 goals in the first 19 games putting him on a direct path to break the franchise record. Things cooled off once Lawrence Pilut was called up and it’d take another 20 games for the next five goals to reach 18. The record as it stands now will show that he scored 19 goals in 41 games. This is the second season for Redmond with the Rochester Americans after the Buffalo Sabres acquired him in a trade from Montreal in exchange for Nicolas Deslauriers. Redmond signed a two year American League contract with the Amerks through the end of the 2019/2020 season that provides stability and pays him NHL money. He’s embraced the comfort of being with one team, in one place, and is having a career season at the age of 30. The American League for goals by a defenseman in the regular season is 30 set by John Slaney in 1999/2000 playing for Wilkes-Barre/Scranton. He set the record in 49 games played that season. Can Redmond break that as well? There’s 35 games left in the season to set a record that could last another 46 years. Redmond wasn’t available for post game interviews. In the last minute of the game he played the puck behind his own net and went down to the ice in an awkward way on his right ankle. He was helped to the ice, the locker room, and did not appear for the three stars selections. He wasn’t available after the game as he was in the x-ray room with the team medical staff. There wasn’t much of an update after the game, will find out more on Thursday.